The project conducted by Suding/Cleland synthesized long-term data on the relationship between precipitation variability and the structure of North American grassland plant communities. They found that while species richness is positively correlated with mean annual precipitation across a spatial gradient, species richness is only related to interannual variation in rainfall at the driest sites, particularly those with high representation of annual species in the local species pool. Further, Lauren Hallett, a graduate student at UC Berkeley supported through this effort, found that sites with the most interannual variability in rainfall were also the most likely to have species that co-vary negatively in abundance. This suggests that communities in variable environments are buffered by having species that differ in their performance under different climate years. This project builds on prior LTER-related synthetic efforts that evaluated the response of aboveground net primary productivity (ANPP) to variability in precipitation and the relationships among ANPP, plant community composition and resource availability in North American grasslands. In addition, the work directly supports the LTER initiative in Inland Climate Change and integrates LTER and non-LTER data to address the impact of different climate change scenarios on productivity, species composition, and functioning of these grasslands. The project led by Julia Jones met to follow up on work initiated in a 2010 workshop. The goal of this project is to test hypotheses about vulnerability and resilience of the water cycle to climate change and land use change in 10 major river basins in the U.S. and Canada. This second workshop focused specifically on seasonal trends and the role of population and land change. Bob Christian’s working group met to expand analyses of social networking that were published in BioScience in 2010. The initial study found a steady increase in the number of cross-site publications produced by LTER scientists between 1981 and 2006. The 2011 working group will look at the factors that act to facilitate cross-site synthesis by examining more than 500 cross-site publications from the LTER bibliography. The LTERMapS project, led by Theresa Valentine, continued work on providing a data discovery and cartography tool for integration into the LTER Network Information System (NIS) through linkages with Ecological Metadata Language (EML) and the PASTA framework that forms one element of the NIS. The team (Theresa Valentine, Jamie Hollingsworth, Adam Skibbe, Aaron Stephenson, Jonathan Walsh, and Travis Douce) worked on developing the framework for a web application, merged data for six pilot sites, and installed the Geographic Information System (GIS) software infrastructure at LNO. LTERMapS will also utilize EML documents to display study site location data for LTER datasets. The base data layers were identified in the 2007 GIS Working Group’s “GIS Recommendations for LTER Sites” (http://intranet.lternet.edu/im/node/480). Best choices of technologies for various tasks will be discussed and supplemented with hands on exercises in using workflow engines, spreadsheets vs. databases, various data streaming device setups and web publishing technologies. Using existing standards for metadata, taxonomic information, attributes, and units will be demonstrated and different community standards as well as implications of a standardized approach discussed. It is expected that ecologists will leave this workshop with a solid understanding of metadata, the tools to create them, and data catalogs for registering and publishing them along with their data and how to prepare their data for long term preservation. The Drupal Ecological Information Management System (DEIMS) group met for four days at the LTER Network Office training laboratory facilities. This customized, hands-on training had the goals of exchanging practical solutions, implementations, knowledge and expertise in the use and development of the DEIMS system. To accomplish these goals, the workshop comprised a mix of new adopters and seasoned contributors that allowed the delivery of a tailored training to all members. Ad-hoc presentations of interest to the entire group were delivered and videotaped for the benefit of all the community, especially for those ILTER members who are DEIMS members but could not participate. The DEIMS project strives to provide common information management tools for participating LTER sites and other members of the ecological community, such the ORNL-DAAC (Oak Ridge National Laboratory Distributed Active Archive Center), LTER Europe (former Alternet), and member stations of the Organization of Biological Field Stations. This year, the DEIMS group welcomed three more LTER sites, making a total of nine sites that are implementing Drupal as a base to manage their information (personnel, publications, metadata records, research locations, etc). LTER GIS working group member Jamie Hollingsworth has been here at the LNO working on a project funded by the LNO to implement an Interactive Cartographic Almanac (ICA). This dynamic mapping tool will create network-wide maps specifically for use in presentations and publications. These maps will enhance our ability to describe and depict the LTER network of sites to funding sources, interested public, and LTER and non-LTER affiliated scientists. The maps will be created in ArcMap and exported to Adobe Illustrator, from where it will be outputted as a PDF file. As a PDF file a user can open it in Adobe Acrobat, turn layers on or off, and add or remove labeling and other cartographic symbols. The map layout will be North America, with Alaska and Puerto Rico included. Antarctica and MCR sites will be provided as insets. The products from this project will be customizable high-resolution professional maps that can be exported from Adobe Acrobat as image files for use in other programs, such as Microsoft PowerPoint, and publications. Sample LTER map from the LTERMaps project. 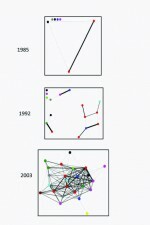 Increasing social networking among LTER scientists (from Johnson et al., 2010).